The half-billion-dollar increase for the Sound Transit 2 Lynnwood line comes as a surprise for taxpayers, and officials will negotiate simpler designs with cities along the tracks. 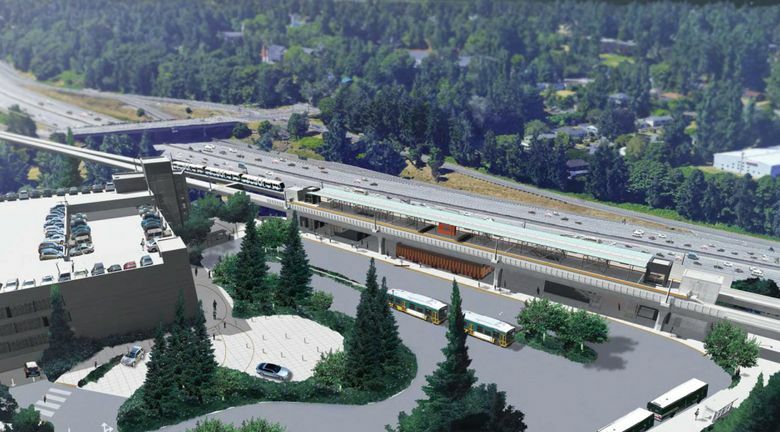 Sound Transit’s long-awaited Lynnwood light-rail extension is running $500 million over budget and is expected to open six months late, in mid-2024, agency CEO Peter Rogoff said Thursday. Staff reports blame soaring labor, materials and land costs in the overheated Seattle-area market, along with features being requested by communities. Also, proposals from the Trump administration to eliminate major transit grants are delaying the customary flow of dollars to projects like Lynn­wood Link. A previous $2.4 billion estimate is now $2.9 billion including trains, according to papers released at Thursday’s board meeting. Such cost spikes could spread to voter-approved extensions from Overlake to Redmond and Angle Lake to Federal Way, both aimed at 2024. Voters OK’d the 8.5-mile Lynnwood-Northgate project in the Sound Transit 2 measure of 2008. Since then, commuters in the north corridor have suffered what may be the region’s worst increase in highway congestion. The completed line would serve 70,000 daily riders by 2035, according to projections, and provide a reliable 28-minute trip from Lynn­wood to downtown. The looming half-billion- dollar increase wasn’t telegraphed last year, as voters considered the $54 billion Sound Transit 3 ballot measure to build eight extensions, including to Everett. Voters said yes in November. “No one was hiding the ball here,” Rogoff said. Costs became more clear only in the last few months, he said, through work with the construction-management firm to complete 60?percent of the design. Board chairman Dave Somers, the Snohomish County executive, agreed and said he had no inkling a year ago just how fast costs were rising. Other high-cost regions, including Los Angeles and Portland, are seeing similar increases, he said. Through the years, officials did report cost escalation to the Federal Transit Administration, going from $2.1?billion in 2015 to $2.4 billion in 2016. Among unforeseen problems: A budgeted 25 percent hike in land costs turned out to be 44 percent, from 2014-17. These expenses include buying out downtown Lynnwood landowners who will be displaced by the trackway and station. Another discovery is the $32 million price to replace 7,000 trees to be removed in the Washington State Department of Transportation’s (WSDOT) Interstate 5 right-of-way. Many are 50 years old, so large trees will be replaced by more smaller trees. Drainage and fire-code changes also are boosting prices. In a recent cost-estimating exercise, Hoffman Construction, which finished the popular UW Station for $141?million in 2016, told transit staff the same job would require $248 million now. Lynnwood’s project delay, from December 2023 until mid-2024, is driven partly by uncertainty in the federal government. During the Obama administration, it was expected the feds would deliver $1.2 billion, half the estimated cost of the Lynn­wood project. Congress appropriated the first $100 million, but Rogoff said he can’t sign construction contracts until a Federal Transit Administration “full funding grant agreement” is signed, hopefully in July 2018. President Donald Trump proposes halting the big transit grants, but key senators, including Washington state Democrats Patty Murray and Maria Cantwell, have been working with colleagues to keep them. Regardless, Sound Transit needs to revise the budget and design early next year, so Rogoff will be ready to sign an FTA award by July. Discussions are needed with Lynnwood, Mountlake Terrace, Shoreline and Seattle, Rogoff said, to agree on design changes that reduce the $500 million somewhat, he said. He isn’t seeking major cuts, such as reducing the 1,500 park-and-ride spaces, or shrinking the bus drop-off loop planned at the Shoreline South/145th Station. Cost trimming has been done before. In the mid-2000s, the agency changed to a simpler roof design at SeaTac/Airport Station to save millions, instead of replicating the grand wing-shaped roof at Tukwila International Boulevard Station. Talks have been underway for a month with Lynnwood, said Dustin Akers, a city planner focused on the rail station there. Ideas on the table include reducing the dimensions for some or all of the 538 new parking stalls, to allow a smaller garage; a simplified, open-air concrete staircase to the overhead station; and shape changes in columns and girders near the train platform. 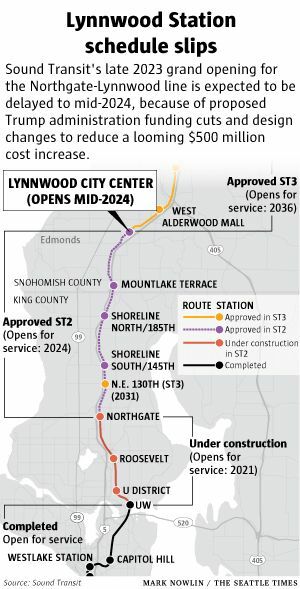 Lynnwood Link’s late 2023 grand opening is expected to be delayed to mid-2024, because of proposed funding cuts in the Trump administration, and rising costs locally. Sound Transit’s local stream of sales, property and car-tab revenue can absorb cost increases, but every dollar spent now leaves less money from the Snohomish County share of tax income to develop future rail service into Everett. The fine print in voter-approved ballot measures gives politicians on the transit board full authority to spend new ST3 money on the Northgate-Lynnwood line, which is an ST2 project. On the other hand, Snohomish County collects less tax income than some other Sound Transit areas, and losing federal aid would create pressure to borrow more money. Rogoff said that after riding the tail winds of the recession and low construction bids, transit managers now face the headwinds of high prices, an expected cycle in the region’s 25-year rail program. Board member Roger Millar, WSDOT secretary, took the news in stride. Highway costs are soaring, too, and a hot economy isn’t a bad thing, he said. “Most of our dollars go back out into the private sector, where it is subject to the laws of supply and demand,” Millar said. Meanwhile, the agency followed the budget numbers with a sunnier news release: Light-rail ridership for spring quarter increased 14.5 percent from a year earlier, averaging 73,907 weekday boardings, between UW Station and Angle Lake.